A cherry blossom tea bowl for whisking matcha. Photo by Ling Luo. This past week a group of Japanese tea ceremony practitioners visited my university, and we got to watch a demonstration. They brought tea bowls with them from Osaka, decorated with cherry blossoms. The flowers have been blooming in some parts of Japan—and in Los Angeles too. So, when I was going to open this blog post, I went through my omamori collection to see about a charm with a cherry blossom motif. There were a few pink ones, but to my surprise, there was only one charm with a sakura design… and it is the first one I ever purchased. I was fourteen or fifteen, and it was my first time in Japan. I could read and write the alphabets, a smattering of kanji, but I could barely string a spoken sentence together. We visited Kiyomizudera, a big temple complex in Kyoto famous for its healing waters and view overlooking the city from the eastern mountains. I bought the charm by myself and attached it to my belt loop, because I had no bag. In hindsight, I’m not sure what I was thinking. I jangled when I walked, and my companions joked that they’d always be able to find me, like a lost cat. I did get lost on that trip, in a lot of ways. But, I’ve still found my way back. Something must have worked. A bell omamori from Kiyomizudera. Kiyomizudera in the summer time, a picture from a trip years later from the bell’s purchase. So, in the spirit of the cherry blossom theme, I went into my photos and discovered that I did not have many cherry blossom pictures either. But I did see a couple taken in Nagoya, with the reconstructed castle in the background, during an illumination, which is when a site puts up lights and lanterns and permits guests after dark. Left: A “light-up” at Nagoya Castle during cherry blossom season. 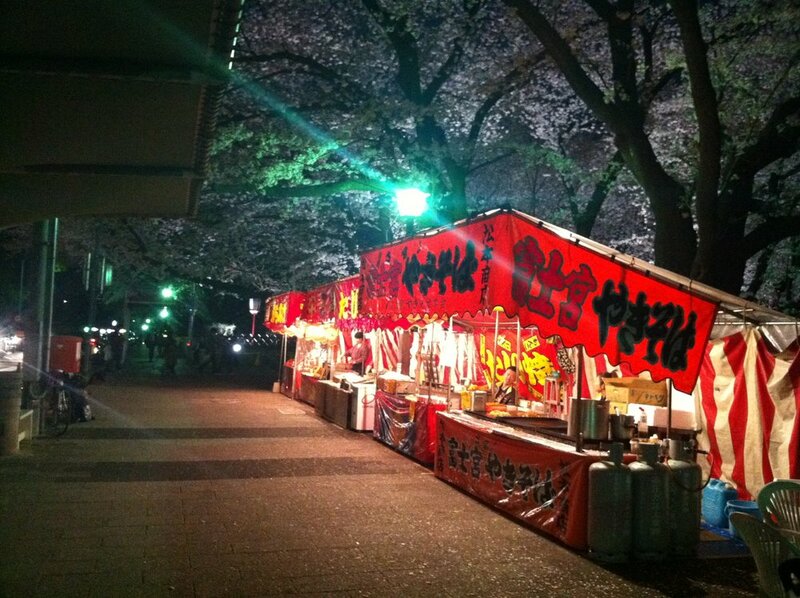 Right: a food stall with cherry trees. In Southern California, it has rained more than usual. As a result, in the past couple weeks, the California poppies have been blooming at spots in the mountains. Last week, an entire small town had to shut down the highways because so many people were coming in and overwhelming everything. 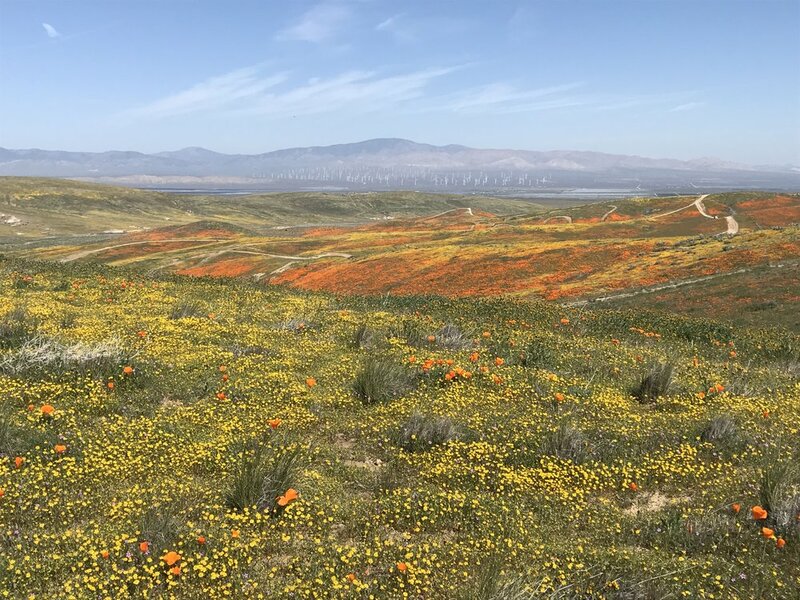 I woke up early this morning and a friend and I drove a few hours north of Los Angeles to Antelope Valley California Poppy Reserve, a state park known for the flowers. It was as if someone had split orange highlighter ink on the hills. There were little brown butterflies who were not interested in the poppies; stubby yellow flowers and purple blossoms. The mountains, ordinarily brown and dry, had turned a warm green. Spring has come to Southern California, marked by the native poppies with that silky glimmer to their orange petals. As I walked the trails, I thought about how difficult it was to describe what I was seeing. Was it orange highlighter ink splattered? Split? If I called the petals “silky” to explain that gleaming line where the sunlight hits the curve of the petal, would anyone understand that? Or would they assume “silky” referred to touch? So, I had to add “glimmer,” but that’s not quite right either. English is difficult. It also contains gaps of darkness, where words ought to be. Speaking of gaps of darkness, writing Kabuki-ish continues in fits and starts. This past week I wrote a romantic scene that has been on the ol’ To Do for weeks. It took three days to write. 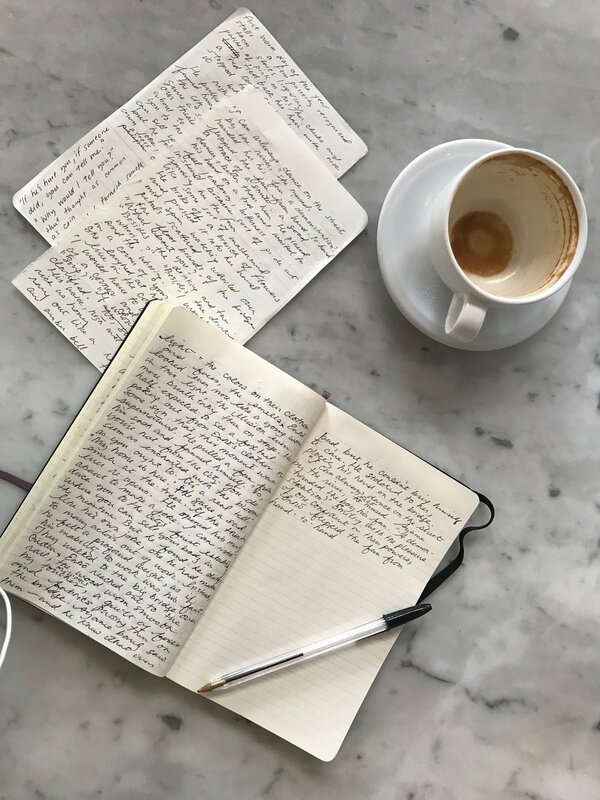 I had a problem with the scene that was not plot or writing, but primarily a failure of process and my own imagination. I knew that it was a date scene, a romantic scene, like one in a musical where a character comes around and realizes they’re in love. My imagination had supplied a haze. Romance, in my imagination sometimes, is a song. It’s a color. It’s a wordless swell. This is all to say that I had a bullet point in my Outline that was basically, “Enkô and Ayame go on a date. Ayame realizes he has feelings for Enkô.” Or, something to that effect. To put it even more bluntly, this was lazy planning on my part. This is not, it must be said, the first time I’ve run into this problem. So, there’s a date scene, and I haven’t done the imaginative work to imagine the specifics. And, dates are all specifics. It’s funny, because romance is a sensation, a haze, but it is built on piles of terribly specific details. So, I sat down to try and think of what those were. It was clear, when I began this process, that I would not be writing this like a normal scene. (I tried to write sentences, got distracted multiple times, and gave up). It’s not giving up. It’s like backing up to realign your car when parking. I began to try and get down to the gritty details, the foundation of the scene really. It was springtime. This would be a springtime scene. What is springtime? I listed words. Eventually, the words started spinning out into phrases. One of the considerations I have to make with Kabuki-ish is whether the prose is going to be written in a quasi-rhyming, beat-driven manner. There are a few scenes written in that way. If I like a word, I try to guess a useful word with a parallel sound. Eventually, I decided to not do that mode for the scene, deciding on straight prose style. I could begin to imagine the setting. I knew what poem I wanted to adapt. At one point in the scene, Ayame sings while Enkô dances for a small crowd on a bridge. 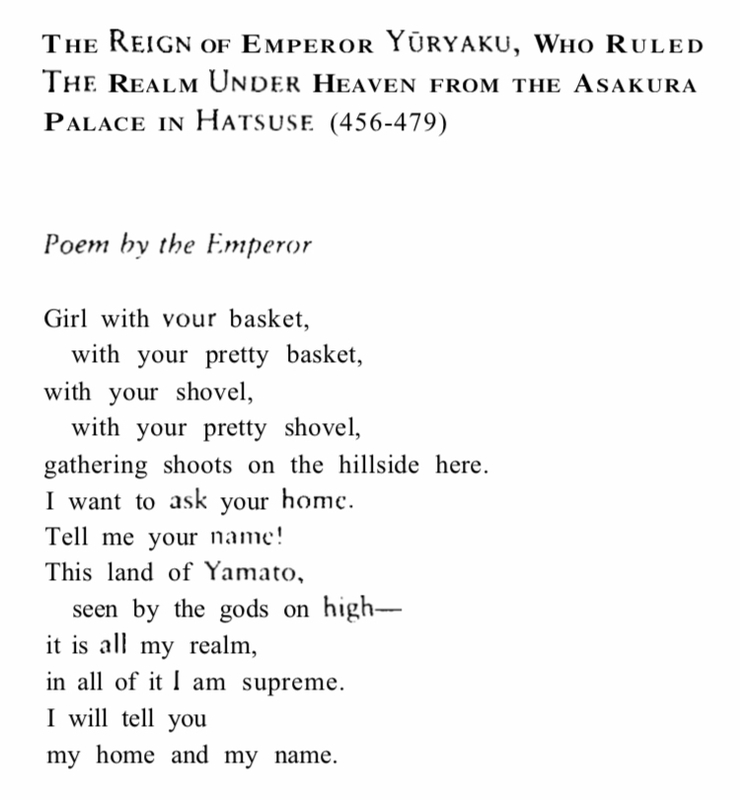 My brain went to one of the opening poems of the Man’yōshū, a romantic poem that would be interesting here. At this point, Ayame thinks Enkô is a boy. Furthermore, at least in the first draft, this scene runs entirely from Ayame’s perspective, which means that Enkô is rocking male pronouns, we don’t see Okuni, and Ayame has a lot to sort through emotionally, even without all this stuff he does not know. One of the themes that this draft in particular has grappled with, is the idea that gender is performed and perceived. There’s a fluidity, yes, but a fluidity from these two categories. So, when Ayame sings like a man who rules supreme over his land of theaters and pleasure quarters, there’s something else going on here with gender too. He sings this song, unwittingly, to a woman performing and perceived as a man. So, over two more days, I took the pieces and strung them like beads into a complete scene. I feel like with these kinds of scenes, it can be hard to see to what degree it works, tonally and emotionally. I had to correct the pronouns on Enkô so many times. I may decide against shifting them in the second draft, but it makes sense the way it is. We’ll see! My favorite scenes are ones that are miniature novels. They begin with a problem, the problem worsens, and then there is a resolution of some sort for the problem. In this scene, it’s not about the romance. I mean, it is. But it’s about Ayame coming to terms with the nature of his fame, his relationship with his fans and patrons, and the lack of trust he comes to realize he has with them. This trust being shifted to Enkô is the backbone of the scene. Trust, ideally, is the backbone of a great romance. I mean, obviously there’s a lot he doesn’t know, and that’s a problem for another chapter. But this was a good challenge to work through this week. “A problem for another chapter,” I write. Who knows when this book will be done? Maybe the poppies know.